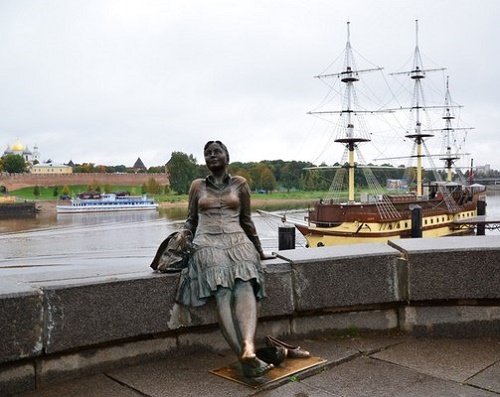 Veliky Novgorod is full of unusual monuments. Made of metal, a tourist girl sat down on the parapet of the main footbridge in Novgorod. And many people just can’t pass by without taking a picture next to her. Neither could Prime Minister of Russia Dmitry Medvedev, who once was noticed taking pictures with the sculpture. Besides, feeling sympathy for this tired girl, some tourists and passers-by don’t miss the opportunity to put a coin into her shoes. Just for good luck. Originally, the sculptor Vadim Borovykh wanted to make a tourist, taking pictures of herself with a mobile phone on the background of Kremlin, but the idea was later rejected. So, the final monument, perhaps, turned out to be much more romantic. 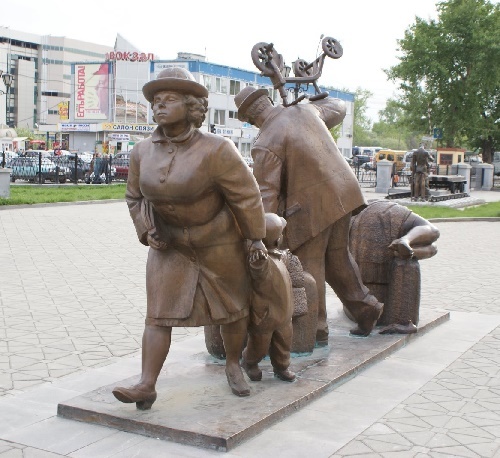 The unusual bronze sculptural composition Passengers appeared right in front of the Museum of Railway Station in the city of Yekaterinburg. It is a building of the old station, that was in use until 2003. Later, it was reconstructed into a museum of railway history of the Urals. Bronze group of passengers is set right at the entrance of the museum building. The passengers represent a family of father, mother and little child standing in the middle. It is evident that they are late for the train. Mom pulls a child, and the man carries all the baggage. Moreover, the funny detail – he looks at another character of the story – a young woman lying on her suitcase and resting. 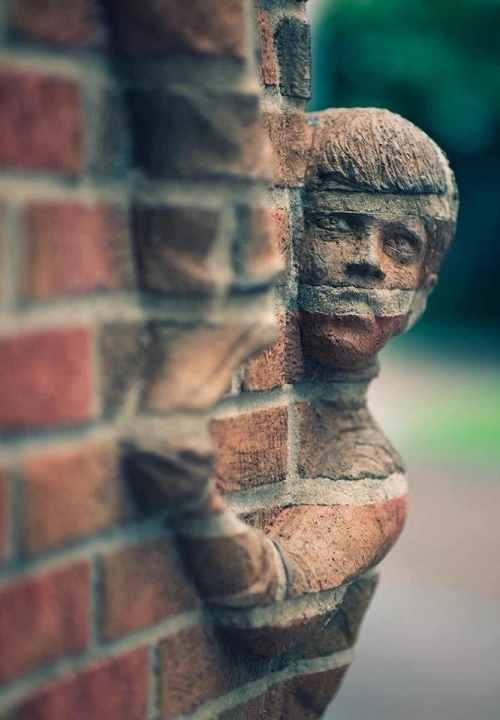 The entire sculpture is so realistic that they seem about to come to life and the family, under the leadership of mother, will go down the street. In August 2005, on the day of Belgorod, citizens and guests of the city had been made a gift in the form of new monuments. 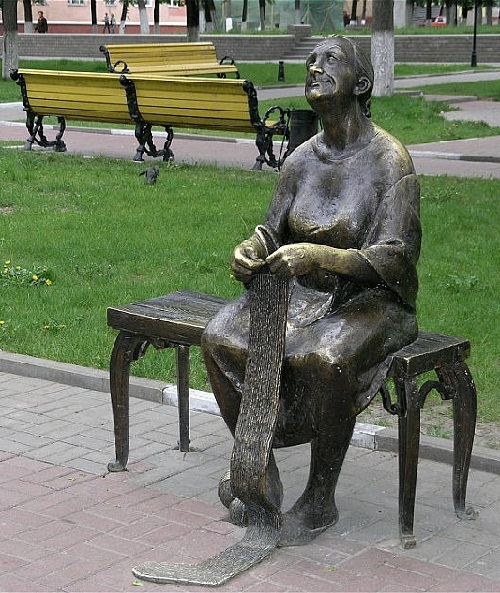 One of them – Knitting grandmother monument appeared in the city center in a park near the Drama Theatre. The sculpture is made of bronze and weighs about 300 kilograms. It was installed among the fountains and benches, ‘grandmother’ is knitting a stocking and thinking about something else. 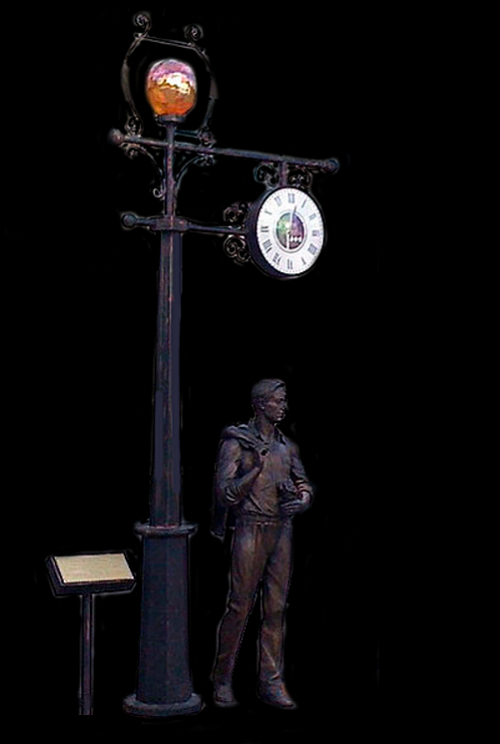 The new sculpture belongs to the category of so-called folk monuments. The authors of the sculpture – young artists from Kharkov Taras Kostenko and Dmitry Ivanchenko. They named their bronze creation “Memoirs.” After the monument had been officially opened, it became a place of pilgrimage. Almost everyone couldn’t help sitting on the bench next to Grandma, photographing, or just telling “her” personal problems. The bronze grandmother has become the hit of the city.